In 1900, Mercedes Benz forecasted that the total demand for cars worldwide would never exceed 500,000. Why? – because there were “not enough chauffeurs” available. Cloud computing is the delivery of computing as a service rather than a product, whereby shared resources, software, and information are provided to computers and other devices as a leased or otherwise metered service over the Internet. Cloud computing is also a marketing term for technologies that provide computation, software, data access, and storage services that do not require end-user knowledge of the physical location and configuration of the system that delivers the services. A parallel to this concept can be drawn with the electricity grid, wherein end-users consume power without needing to understand the component devices or infrastructure required to provide the service. 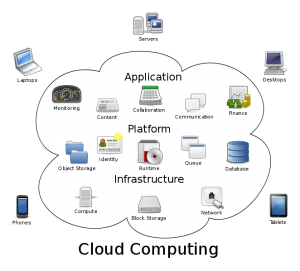 At the foundation of cloud computing is the broader concept of infrastructure convergence and shared services. This type of data center environment allows enterprises to get their applications up and running faster, with easier manageability and less maintenance, and enables IT to more rapidly adjust IT resources (such as servers, storage, and networking) to meet fluctuating and unpredictable business demand. Most cloud computing infrastructures consist of services delivered through shared data-centers and appearing as a single point of access for consumers’ computing needs. Commercial offerings may be required to meet service-level agreements (SLAs), but specific terms are less often negotiated by smaller companies. The tremendous impact of cloud computing on business has prompted the government to look to the cloud as a means to reorganize its IT infrastructure and decrease spending. Many agencies already have one or more cloud systems online. IBM and other mainframe providers actually conducted this kind of business throughout the 60s and 70s, offering computing power and database storage, on a time-sharing basis, to banks and other large organizations from IBM world wide data centers. The advent of mini computers changed this business model, by making computers affordable to almost all companies. As Intel and AMD increased the power of PC architecture servers with each new generation of processor, data centers became filled with thousands of servers. IBM, HP and Microsoft were early leaders in the new field of ‘Utility’ Computing with their business units and researchers working on the architecture, payment and development challenges of the new computing model. HP introduced the Utility Data Center in 2001 offering services such as “IP billing-on-tap.” Sun announced the Sun Cloud service to consumers a year before that. Today, a handful of highly sophisticated cloud computing providers, like Cloud9 Real Time, provide specialized cloud computing and application hosting to a myriad of SMB industries such as accounting and the financial sector.